Roy Zafrani is a young, Tel Aviv-based filmmaker, and producer. No matter what theme he touches, his movies are winning the most prestigious awards and screened in front of crowds globally. His life is about creating documentaries that go beyond the comfortable surface, and leave a lasting footprint in the audience. Recently Roy’s name was featured in all the major papers. But not for the reasons his personal or artistic missions would desire. Yes, we can’t deny that his latest movie was subject to an unjust rejection by a Norwegian Human Rights Film Festival, but Roy never wanted an ‘eye for an eye‘ nor was he seeking revenge. Instead, he moves on and honoured Artist 4 Israel with an exclusive interview, where he was happy to talk about his challenges as a filmmaker, the fine line between art and politics, or the reasons he chooses to work on sensitive topics. 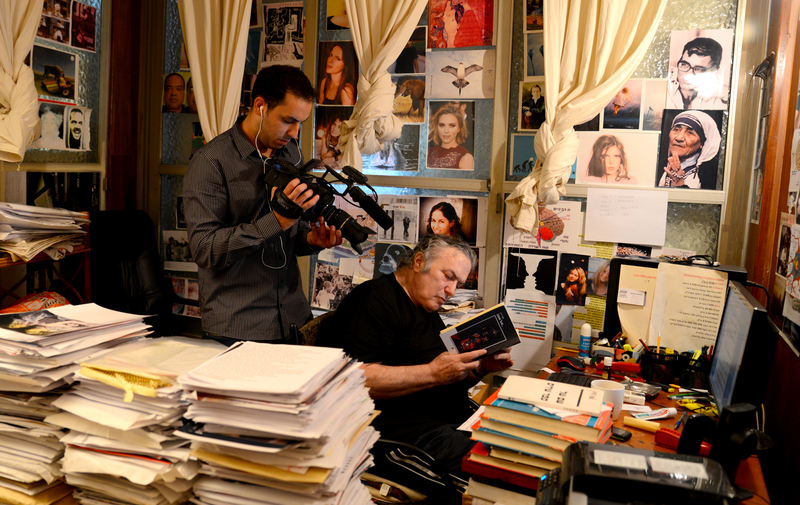 You are a documentarian, a filmmaker, an award-winning director and, now, a bit of a celebrity. How do you define yourself? I was just recently tagged with a hashtag #JustAnArtist, which defines me perfectly. My character is very far from what “celebrity” represents. One of my closest friends wrote me a few days ago that the term “anti-celeb” quite fits me. To answer your question, I would define myself as a filmmaker and educator who strives to make a positive change in society. Your latest short documentary movie, The Other Dreamers, is about four disabled children, who are ready to fulfill their dreams. What makes this movie so powerful that just as we talk it received another award for excellence in San Francisco? The Other Dreamers is a special project that I worked on for over three years with zero budgets. It’s amazing to see its achievements. At some points over those three years, I was certain that the film would never be released. It’s very hard to make a documentary for such a long time and on 100% voluntary base. But somehow with the help of a great team who volunteered and believed in the film and its message I managed to complete it. The audience is going through the same experience that I’ve gone through. From looking at the wheelchair at the start, we raise our head and look at the child. After 5 minutes of watching, however, we don’t see any wheelchairs or disabilities anymore, we only see the human beings. So, I think that the power of The Other Dreamers is that everyone in the film wears no masks at all. It’s an honest, inspiring and touching film, and people appreciate that. The children in the film are undergoing treatment in Israel. Is there anything unique or different about this treatment? The film takes place in Nitzaney Rishon, a voluntary association for disabled children in Israel. There are many organizations that take care of disabled kids, but the unique thing about the treatment in Nitzaney Rishon is that they make these children have a belief in themselves. They have their dreams and hopes, like anyone else, and all they need from you is to believe in them, too. Some of them want to be football players, study in a university or become a professional dancer. When I started my journey there, these dreams seemed unrealistic for me, but then I realized that they made me believe it’s possible. From The Other Dreamers and your previous works – Always Be Happy, On Tiptoes – it seems that you are continuously wrestling with sensitive topics. Would this somehow be your mission to cover such issues? Before making The Other Dreamers, I made two documentaries about disability. Even though these films deal with the sensitive topics and the negative aspects of society, both On Tiptoes and Always Be Happy have a positive message of equality. 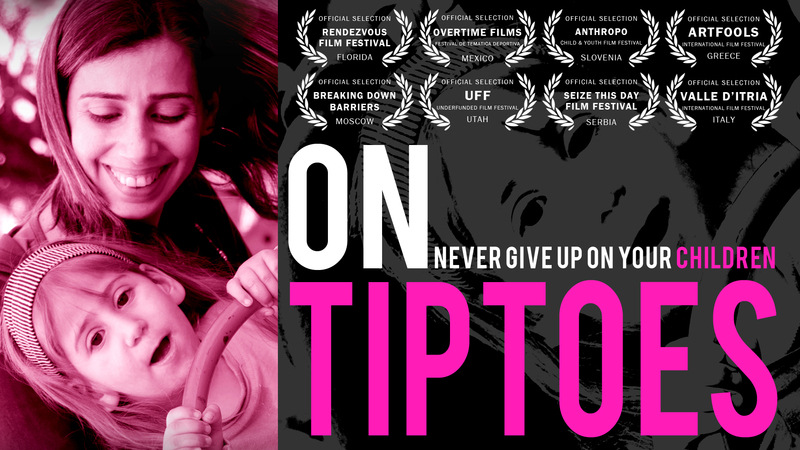 On Tiptoes was one of my first documentaries, and I remember finishing each day of filming with so many emotions and the passion to make a change. That was the time I knew that documentary filmmaking was my destiny. In particular, at least two of your works feature kids with development challenges or disability. What triggers your interest in them? I have a disabled cousin who suffers from CP (Cerebral Palsy). Her name is Sapir, and she’s the daughter of Nitzaney Rishon’s chairman, Yoram. Over the years, I saw and admired him for the way he fought for her, to become an equal member of society. When Yoram realized it was impossible, he founded the voluntary association to help other parents of disabled children, who were facing the same problems. Was there any personal experience that drives you to change the way we feel, think and treat disabled people? When I started working on The Other Dreamers, I had no idea that it would take so long to complete. I planned on filming for a few weeks, then editing and moving on to the next project. But after a month of filming I found out an amazing thing about myself. I started watching the footage and noticed that on day 1 I treated these children like they were babies. I said: “Yes, honey”, “No, cutie” and other things that you would say to a very little child while some of them were already 18 years old! Then between day 1 and day 20 it was easy to see the differences. The more I stayed there, the more I understood that this kind of development could only happen within their own “field.” Outside Nitzaney Rishon, they are different. But when you stand inside Nitzaney Rishon, you are the one who’s different. And if they accept you for who you are, you should do the same. And this experience became my drive. Do you see a need for a change in the way the larger community treats the disabled? Of course. We must treat them as equals; that’s the basis. I think it’s very important to integrate them into society from the early years of childhood. Not only when they’re adults, but also in school and even kindergarten. Do movies have the power to create social change? If I didn’t believe that, I wouldn’t make films. It would be pretentious to say that I want to change the world, but if my film touches even just a few people and makes a small change in their lives, then I’ve succeeded. Your company, Magic Productions, also works on corporate videos and graphic designs. While The Other Dreamers was created on 100% voluntary basis, and you choose the topic, corporate projects are surely profit-driven and give you little leverage. How do you make them work hand in hand? I founded Magic Productions after years of experience as a filmmaker, but none as a manager. So soon, it was clear that I needed to make a change and become more profit-driven. When I started my career, I focused on the artistic side and the storytelling, and now I suddenly had to change my perception and think like a businessman. Making a film completely voluntary, while running a small company, is very hard. I knew that I would have to work twice as hard, to complete the film without hurting the business. I think that without believing in the message of The Other Dreamers, I simply wouldn’t have been able to complete it. What challenges do you face as a filmmaker? There are many challenges: from trying to find the right producers and finance the films, to technical issues and bureaucracy. But these are things that every filmmaker has to face. Does working on such sensitive topics (such as the disabled) have its own unique challenges? Once you have to deal with bureaucracy, things always get harder and slower. So I would say that the topics matter less; the question is rather about how many approvals you need to start filming. Does being an Israeli filmmaker add to your challenges? I wouldn’t call it a challenge, but an opportunity. Most of my films are aimed at an international audience and showing people the different sides of Israel is also one of my goals. People expect Israeli films to be political, to have a say about the Israeli-Palestinian conflict, and when they realize that we deal with more issues in our society, just like them, it’s easier for them to identify with the characters. We know that your latest work shook up the media, and your name appeared in all the major newspapers. As you clearly pointed out, you are not a politician. And we agreed not to politicize here. But, can we admit that there is a fine line between art and politics? How do you walk this tightrope? 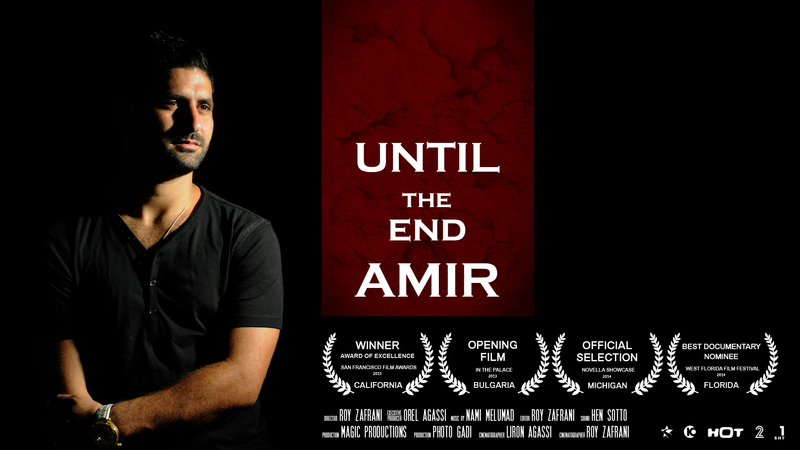 Three years ago I made a documentary called Until the End Amir. It is about the tragic story of Amir Menashe, who was killed in the terrorist attack in Burgas. Five Israelis were killed there, and it was definitely the hardest film I’ve ever made. It was heartbreaking interviewing his wife and family and filming his 2-year-old son Rom, who didn’t know the life he was going to have, without his father. It was the first time I had to deal with a political topic, but I chose to focus on Amir’s story, and not on the other side – the terrorists. In post-production, we edited out every scene that involved politics, and I think we made the right decision. It was screened everywhere, on several TV channels, and film festivals and the most important thing is that many people in the world learned about the consequences of terror from the eyes of Amir’s family. I think that if I had made it political, people would prefer to stay away from it. My team and I attended an international film festival in Bulgaria, together with Amir’s wife and sister. Until the End Amir was the opening film of the festival, and I remember the moment the screening ended. We were the only Israelis, in a crowd of viewers from all around the world, and everyone was crying. I will never forget the impact that film made on them; they were absolutely shocked. So there might be a fine line between art and politics, but how we walk this tightrope is about the decisions we make. Speaking generally, do you think art has the power to change public perceptions on a national level? Yes, I think that a film, especially a documentary that stays in the hearts of many people, can make a change. Documentarians have a platform that almost no one has. We make films about real people, and by telling the right story we can touch the hearts of millions of people worldwide. Do you see that artistic freedom is being curtailed by political concerns in areas of the world (regardless of the politics)? Yes, these things are disappointing. Cinema has an outstanding opportunity to bring people closer, and being curtailed by political concerns just deepens the rift and hatred between people. The more we are exposed to new ideas and different thoughts, the more we are able to understand the other side. This, of course, is true, unless a filmmaker uses the artistic freedom for dangerous propaganda or anything that could hurt people. How do you define your creative mission? What do you want people – who see your works – to say about your movies? I want people to leave the cinema with a new perception. Making a touching drama or a funny comedy is great, but I’m not making films just to entertain people. My mission is to make films to remember, films that will stay in the viewers’ hearts for a long time. What is your next project about? When and where can we see it? I’ve been working on two documentaries that will be released worldwide in 2016-2017. The first one is an animated short documentary, called Over the Wall. It tells a story of Nathan and Khaled, two best friends from both sides of the wall. It’s a non-political film, which shows that without outside factors that influence us, like politics and brainwashing, we could actually live together and become friends. The second one is a feature-length documentary called Never Alone. This tells the story of the American lone soldiers of Israel. I wanted to find out what makes someone leave his home, family and friends and risk his life by protecting a country he had never lived in. If you stay away from agenda and politics, and just listen to these teenagers, you’ll find out a wonderful story about people who are willing make a big sacrifice for a larger cause. What is your message to people, who – for whatever reasons -, feel reluctant towards Israeli art and artists? First, there shouldn’t be any reason to feel reluctant towards Israeli art and artists. I would never feel this way about anyone in the world, just because he/she lives somewhere. It might seem too naive, but I believe that most of the people in the world want to live in peace; being able to separate politics from arts or sports could be a great first step forward towards peace.